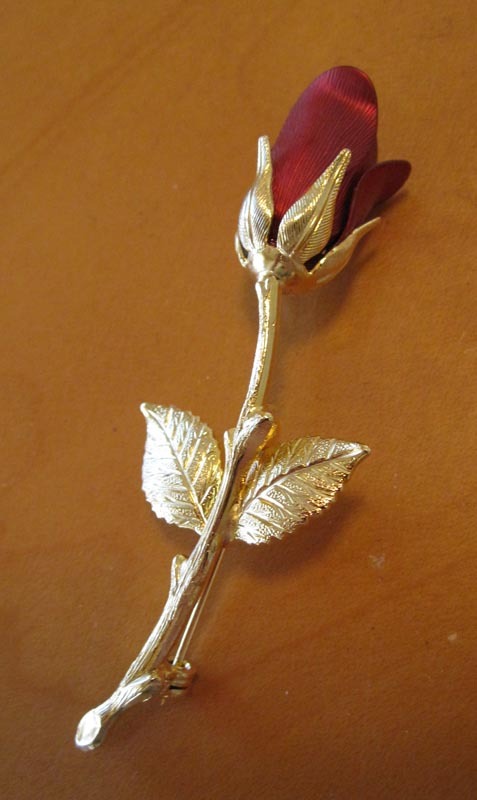 This pretty red rose brooch pin was given to me during my senior year of High School by my good friend, Deidra (Eickholt, Penny) Moitzheim. It’s about three inches tall and is gold plated. I tried wearing it a few times but it’s too large and heavy to fit nicely on most sweaters. I’ve kept it in my jewelry box and enjoyed looking at it all these years. It’s a nice reminder of our friendship. http://www.jessicagreen.com/wordpress/2012/02/09/treasure-chest-thursday-red-rose-pin/You must be logged in to post a comment.